Written by Kevin George on May 25, 2018 Email Marketing Guide. We hope you’ve enjoyed this four part series on email marketing! To wrap it up, we want to leave you with some inspiration. Here are some emails that stand out from the crowd, from across every stage of the email lifecycle. Welcome Emails: Paul Smith’s welcome email thanks their new subscribers and highlights core features of their online shop. They also include clear links to their social media profiles, so people can connect with them across the web. “Complete your profile” email: Reaching out to customers and asking them to add info to their profiles is a neat way to know more about your customers, and helps in personalizing emails and segmenting your mailing list. As of WooCommerce 3.4, customers can upload a profile photo. This email from Hired shows the recipient exactly what step of the account creation process they’re in. They can quickly see how many steps are remaining, the copy is short and crisp, and and the call to action — “Finish your profile” — is clear. Product update emails: Update emails are most often used in the electronic goods and fashion industries, where products change or need to be periodically upgraded. 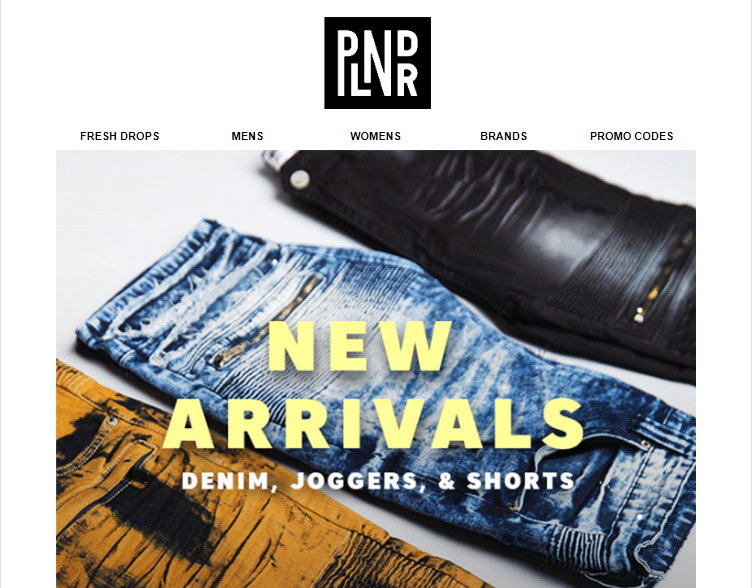 Brands like PLNDR send product update emails that clearly mention new products in the subject line, email copy, and even the hero image — bold and unmissable. Newsletter emails: A newsletter email has two equally important functions: it updates subscribers, and helps them feel connected to your brand. Survey results reveal that sending a newsletter every two weeks yields the best customer engagement results. Sale announcement emails: Everyone loves to save money! Most online retailers increase their revenue with sales. This email from Gilt announces a limited-time discount on every product. 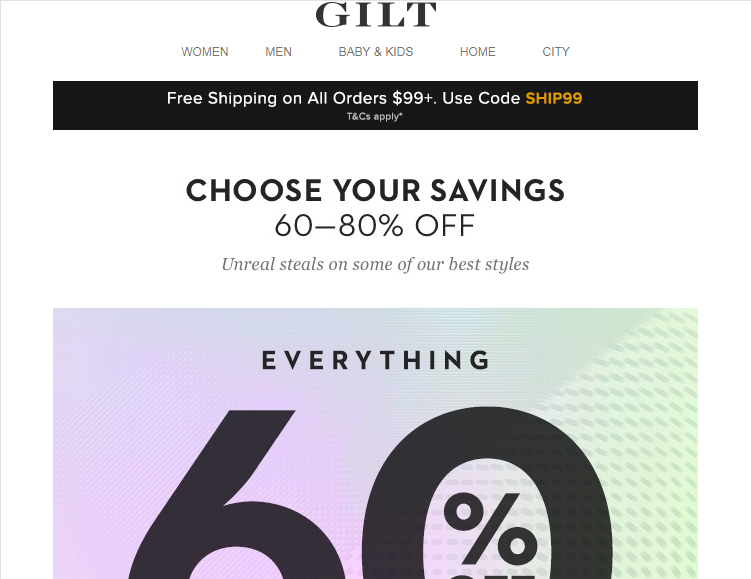 A promotional email from GILT announcing a sale on all items. Holiday Offer emails: Like the sales announcement emails, these highlight holiday-based sales. Godiva’s email has an Easter theme and holiday-specific offers. Order receipt emails: For WooCommerce, these live in WooCommerce > Settings > Emails. An order receipt is triggered immediately as a customer completes a transaction on your website to inform them that their order has been successfully placed. Confirmation emails boast an open rate of 70%. This “Order receipt” email by Huckberry follows a standard rule for confirmation emails: 80% transactional and 20% promotional content to cross-sell relevant products. This way, the subscribers can opt to buy a product by clicking its image. Shipping confirmation emails: The moment we all wait for after buying a product online… shipping confirmation! These emails will usually be pretty well received, so consider adding some excitement and fun with your email copy. A standard shipping confirmation email will contain all the information that’s in the order confirmation email, so many sellers combine both into a single email. 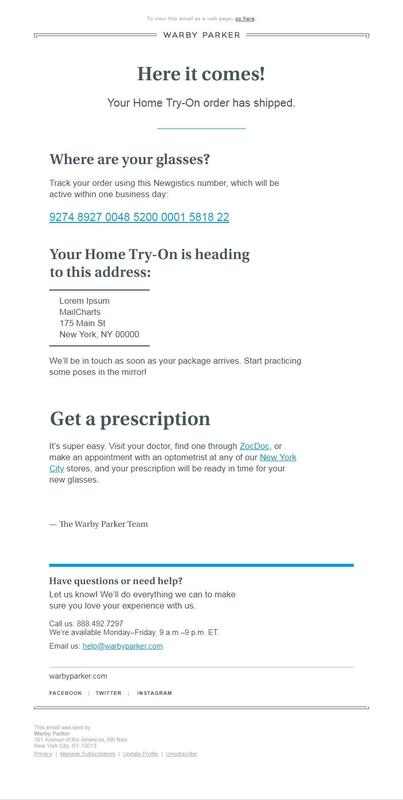 The key information in a shipping confirmation email are the tracking number and link; this shipping confirmation email from Warby Parker includes a dedicated tracking number plus instructions for getting in touch with their support team. Re-order suggestion emails: Coffee, pet food, razor blades — for any product that needs to be replenished periodically, you can use re-order emails as reminders for your customers. 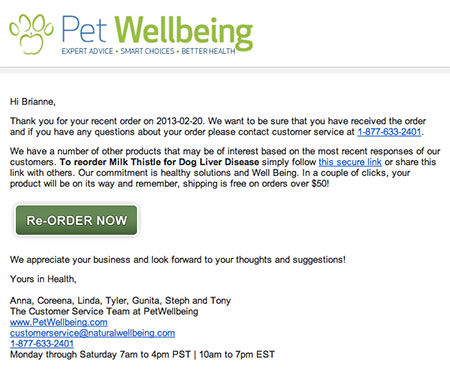 Pet Wellbeing’s reorder email reminds the customer about their recent order, an includes a customer service number for feedback. To make things as easy as possible, it also includes direct link allowing the customer to add the product to their cart and get it shipped. Product suggestion / recommendation emails: A customer’s purchase history helps you identify their product preferences and suggest products they might like. This type of targeted marketing is a way to engage and win loyal customers. Lowellita nailed the product recommendation email by suggesting additional clothing options that make great combinations with products the customer recently purchased, and the images help the customer visualize how the recommended products would look. Cart abandonment emails: 74.52% of all online carts are abandoned! But thankfully, gentle reminders in the form of cart abandonment emails get more than half of them return back to complete their purchases. As a testament against the stereotypical notion that cart abandonment emails are only sent by eCommerce sites, this email by online travel portal Secret Escapes reminded receivers of the availability of a hotel for a limited time period. By adding the image of the resort along with a discount offer and offer-ending time, the customer is prompted to return to their booking. Apology emails: To err is human, and every email marketer worth their salt has sent a erroneous email at least once. Sending a follow0up apology email and admitting your mistake is a way to build rapport — and prevent tarnishing your reputation. 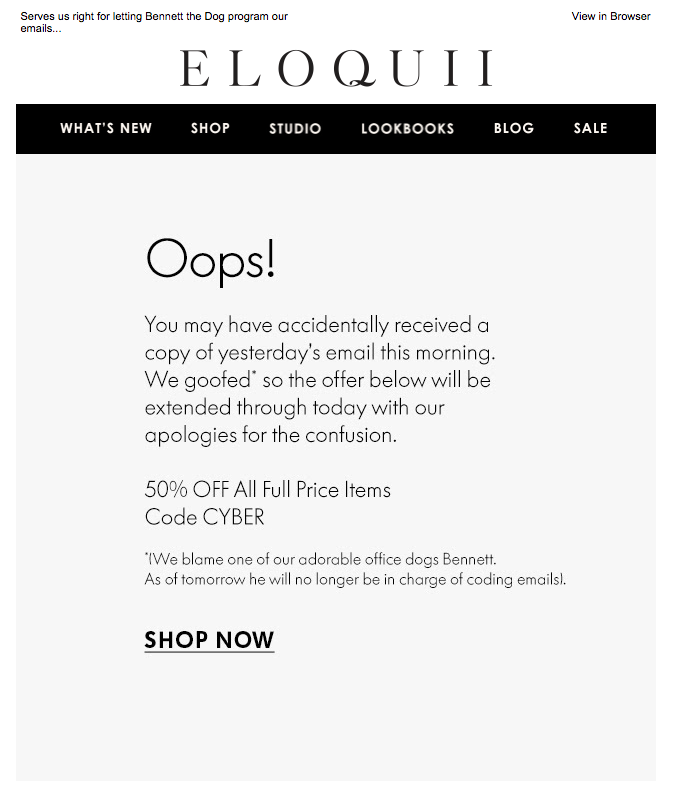 The people at ELOQUII responded to their error by apologizing upfront, then delighted the customer by extending the duration of their discount. 65% of new businesses come from referrals. A positive referral builds a customer’s sense of a product’s quality and the level of service they can expect. Social proof is proven to drive conversions, so set up automations that politely request reviews from customers after every order. This UnderArmor email asks for reviews of individual products. Each purchased product has an image for ease of reference. Macy’s takes a different approach to the, with a prize drawing to sweeten the deal in return for a review! Customer loyalty emails: Rewarding loyalty is… rewarding. For regular customers, special treatment will build their existing affinity to your brand. You can set up loyalty emails for different milestones, like a one–year anniversary, order target, or order frequency — consider which milestones work best for your business. 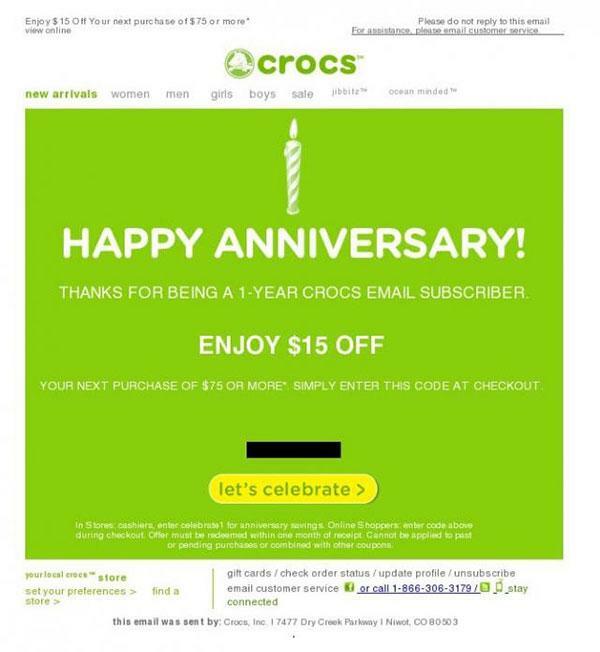 Crocs has a straight-forward email for their loyal customers: they offer a discount coupon for all customers who have been associated with the brand for more than a year. Birthday / anniversary emails: If you store your customers’ date of birth or anniversary date, sending them an email on their birthday — with an offer — is a nice excuse to say hello. This might also prompt a customer to talk about your brand with their social group. 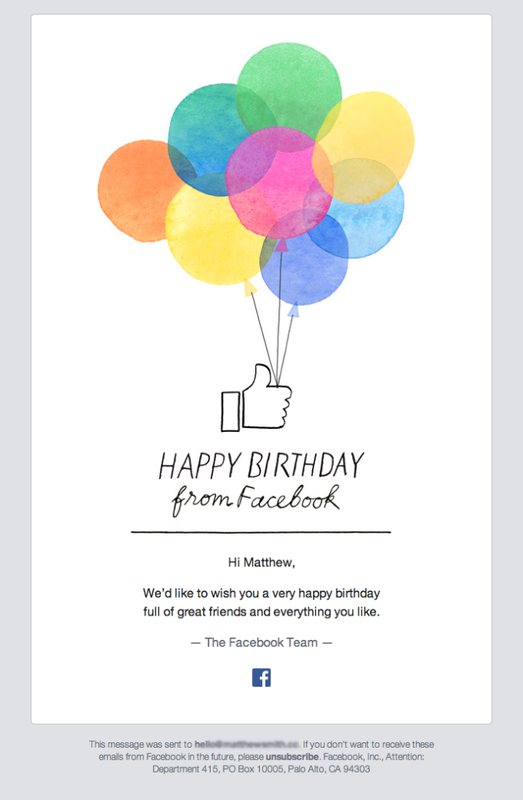 Facebook has its users’ birthday information, and they use it to build customer relationships and reinforce their brand style and feel. Testimonial emails: Like reviews, testimonials help prospective customers see how satisfied people are with their purchases from you, motivating them to make a purchase. 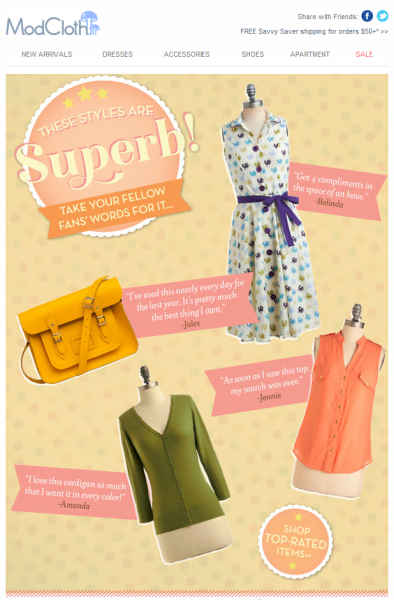 ModCloth uses images of their products along with customer testimonials for individual products. Instead of reading paragraphs of detail about each item, customers look at the item itself alongside the testimonials of customers who vouch for it. Password reset emails: We all have dozens of online accounts, and it’s easy to forget passwords. Triggered by a user’s request, password reset emails have the highest open and click rates (for obvious reasons!). Take a moment to put some care into the copy — it’s an easy way to bring a smile to a subscriber’s face. We like how this VerveWine email uses a humorous image based on their product (wine), and reassuring copy in their “Password Reset” email. eCommerce means products bought and delivered to doorsteps far and wide, without being bound by geographical boundaries. Email marketing helps you reach customers anywhere in the world to nurture and engage them as they get to know your brand and product — and hopefully, it turns them into lifelong customers. Share your tips and experiences, or brands you feel do an excellent job with email marketing, in the comments below! Excellent post on taking advantage of email to market your eComemrce product. Thanks, what a great article. Excellent post with lots of different suggestion. Thanks for sharing this really nice article.